With a name like Wayne Tinkle he must be good. Tinkle is the coach of the Montana Grizzlies, whom the Dukes will face off against tonight in the first round of the College Basketball Insider Tournament. Montana is coming off a season in which they made the NCAA Tournament and hung with New Mexico in the first round before losing. They lost their best player, Anthony Johnson, who goes by AJ much like a certain player who led Duquesne to its most success in recent years. The Grizzlies are led by Senior big man Brian Qvale and sophomore point guard Will Cherry. Qvale is of particular concern being a 6’11” 260 pound monster who can bang with the best of them. They also have a 7 footer but he is more of a European center that can stretch defenses and make threes. He is not much of an inside threat however. 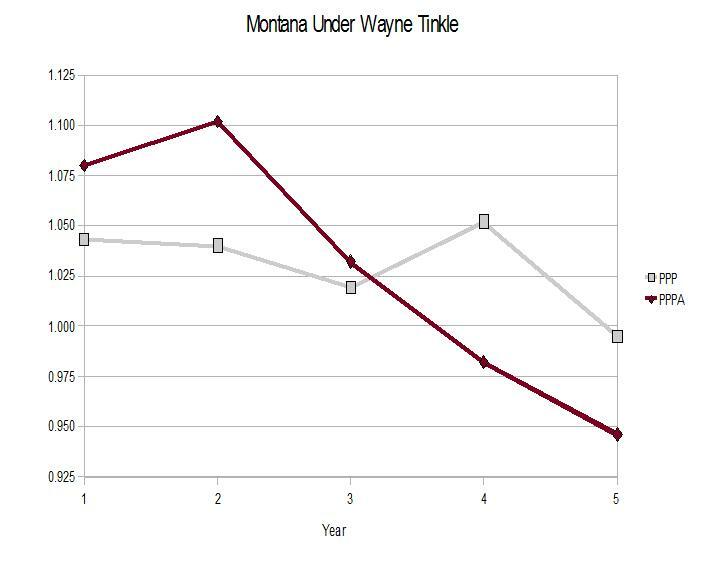 It seems clear that Tinkle has focused his game plan on defense over his time in Missoula as the graph above indicates. 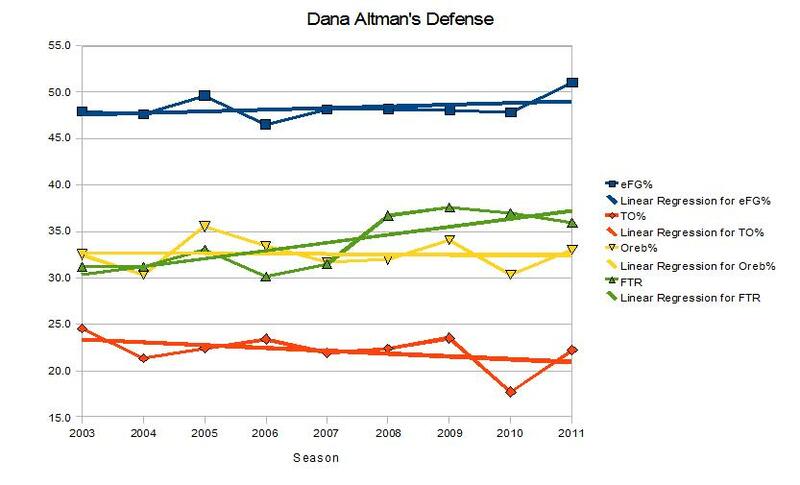 Montana has improved every year on defense but has struggled on offense hanging around 1.000 point per possession. Furthermore, its a tough grind you out type of offense which is predicated on one of the best field goal defenses in the country (see table) ranking 11th in effective field goal percentage. 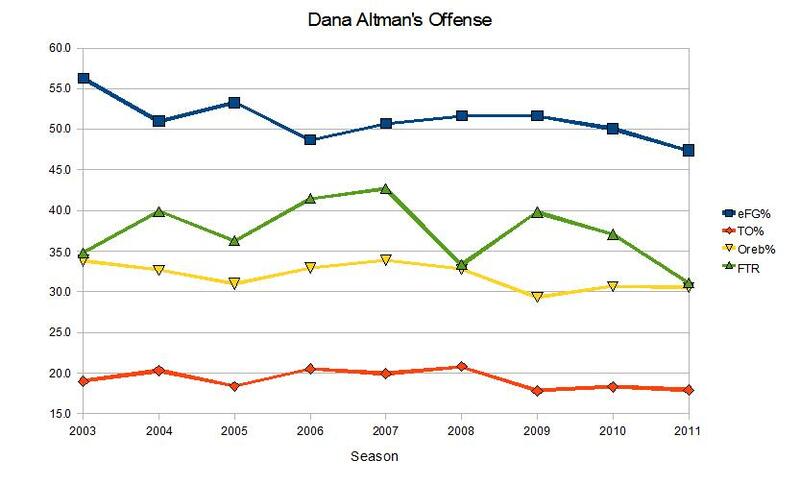 The offense on the other hand is not that efficient even though it is one of the slowest offenses in division I. In this interview of a writer from Grizzly Journal on Yuku Dukes. GJ: The Griz are a legitimate defensive machine, having held opponents to a 14th ranked NCAA Division 60.1 points allowed for 2020-11. Qvale became the all-time Big Sky leading shot-blocker with a 2020-11 average of 3.0 blocks per game, good enough for 14th best in Division 1, while Cherry’s 2.7 steals per game ranks him ninth nationally. But… well, yes… Montana has struggled against faster, quicker teams. Expect Montana to try to contain the Dukes’ uptempo game to the half court, both on offense and defense. Offensively they like to “feed the monster” (Qvale), but usually win when they get double-figured scoring balance. This game will be all about tempo. As the same writer claims, “a combined score under 135 favors the Griz; anything else tilts toward the Dukes.” If Duquesne can outathlete the Griz it will be tough for them to compete, but if on the other hand it becomes a knockout-dragout type of affair it is likely Montana which advances. I am concerned but the good news is as was pointed out in the interview. GJ: Missed free throws cost the Grizzlies two regular season wins, and one was season-wrenching… a 4-point, overtime loss at Eastern Washington in Montana’s final league road game that cost the Griz the Big Sky title and the host role. To add insult to injury, Montana clanked an icy 12-for-19 (63%) in their 65-60 Big Sky title loss at Northern Colorado last week. Win or lose this could be one of the worst combined free throw shooting performances in the history of college basketball. Should be fun. Efficiency, that is the name of the game for Chris Mooney’s Richmond Spiders. Both the offense and defense are built around maximizing results. Richmond ranks fifth in the Atlantic 10 in defensive efficiency and second in offensive efficiency. It does seem clear that Mooney builds his team around offense with a solid to good defense behind the offense. The interesting feature of Mooney’s clubs at Richmond is that it excels and lack in the same categories on both sides of the ball. Over the past three seasons the Spiders have generally been good at avoiding turnovers on offense while creating them on defense. Similarly, Richmond teams will shoot well and contest shots at the other end. The table below gives the national ranks in effective field goal percentage (eFG) and Turnover rate (TO%). Now compare these data to the other table. Notice a difference? Where Richmond has been good in the first two areas, it has struggled with rebounding and getting to as well as preventing opponents getting to the line. (Oreb=offensive rebounding rate; Dreb=defensive rebounding rate; FTR=free throw rate FTA/FGA). Those numbers are remarkably consistent and should look familiar to Duquesne fans being that Ron Everhart’s teams follow a similar pattern. There is a big difference however. Richmond tends to play slower and Duquesne tends to play a faster pace. Mooney, having played for Pete Carrill at Princeton has adopted Carrill’s famed offense. Look at it this way, Mooney’s offense is like Duquesne’s offense but better. The Dukes give more of a motion look as opposed to Richmond’s set offense. Nonetheless, both teams are dependent on the three point shot and strong back cuts to the basket. The Princeton offense can be effective but it is troublesome to me because, as is evidenced by the numbers, offensive rebounding is lost. The best teams are able to adjust and teams dependent on long jumpers that don’t crash the boards are susceptible to losses when shots are not falling. Then again, I’m a back to the basket forward type. Needless to say, I like rebounding. Every Spider shoots the ball, including player of the year candidate 6’10” center Justin Harper. Harper can play on the low block, flash for mid-range jump shots, shoots 49 percent from three and makes over 80 percent of his free throws. Did I mention he is 6’10”. The Dukes will have difficulty guarding him because of his height. They do not have anyone that can contest any jumpers. Combine Harper’s game with 2009-10 A-10 player of the year Kevin Anderson, a strong slasher who makes 42 percent of his attempts from behind the arc. Anderson has the ability to take over games with his scoring prowess. Richmond is tough offense to stop, so it is best to hope that they miss since they are such poor rebounders. The best advice for the Dukes would be to take advantage of Spider misses by pushing the ball down the floor on all rebounds. Getting quick strikes will allow Duquesne to stay with Richmond if its offense is hitting on all cylinders. Unfortunately for the Dukes, Richmond does not turn the ball over often, but if they can force the Spiders to cough up the ball they will have a chance to pull off the upset. Duquesne controls its own destiny regarding getting the four seed and a bye for the league tournament. Doing so would place this season amongst the best in the history of the program. Also, a win tomorrow would help ease the sting of some of the tough losses this season including last week’s affair at St. Louis. One fortunate factor may be that Richmond does not foul much, so the Dukes’ deficiency at the line may not be exploited. For Everhart’s club, it’s a long haul but a win in Virginia is not inconceivable. It’s all doom and gloom on the bluff, an all to familiar feeling of what could have been has swept Dukes nation. I would be lying if I did not count myself amongst ranks of nervous nellies after seeing the score line of Saturday’s game at St. Louis. I was out at a friends party on that day and was not able to watch the game, and I’m glad I didn’t. As the days have gone by however I have grown more hopeful that the Dukes can salvage what may appear to be a lost season. There are tangible reasons why Duquesne fans should not be totally distraught. As sports fans we are often drawn to the mystical and superstition. We believe in silly things like curses and destiny. Sports stands as a realm of illusion in a troublesome world that many of us are seeking escape from. It is for this reason that sports has such an appeal. For those of us fans of downtrodden teams, we should know better. There is no such thing as a curse or destiny, only management, execution and circumstances. In particular the fans of poor teams should understand bad management well. We have endured the likes of Scott Edgar, Darrelle Porter and the incomparable Danny Nee. Those are the faces of mismanagement. That is why the program has been down for so long. Ron Everhart has done an excellent job in making the program relevant again. I get physically upset when the team loses, that did not happen during the Nee reign of terror because a loss was expected. With Everhart we expect to win, that is a huge sign of improvement, but it also makes it hurt more when the team does lose. I through my laptop that I was watching the game on after TJ McConnell turned the ball over in the URI game. I was angry because I felt the game was allowed to slip away. I was angry, not somber. I don’t believe in curses or “woe is me” attitudes. That has helped me get through tough losses. Winn is correct. The Dukes have not played all that poorly as of late with the exception of the SLU game. Maybe fortune has not been on their side. Problems do remain as we Duquesne fans know all too well. Duquesne has not been good in close games due largely to poor free throw shooting and a tight stagnant offense. The team does still has it in them to jump out on an opponent early as it did in the UMass game. There is little reason why that cannot happen tonight against the Bonnies. The ability is still there but can the Dukes actualize that potential. Consider this, if the Dukes take care of business on Senior night against Bona, and steal wins against Richmond and perhaps Xavier in the A-10 tournament all would be mended. Big wins like those would make up for all the tough losses of these past six games. While it is largely understood also that Ron Everhart has had difficulty closing out seasons since he has been at Duquesne there are counterexamples. Below is a table comparing his records in the last eight games of the regular season (not including the league tournament) and his record in games proceeding the home stretch. Looking at the bottom line reveals that Everhart’s clubs have had serious difficulty winning at the end of the season. However, that analysis is a little skewed because of his performance in his first season in which he had a poor team and this season. The remaining three seasons place him with exactly a .500 winning percentage, close to his career mark. Consider this. Going into the Atlantic 10 Tournament in 2009 I expected the Dukes to lose in one of the first two rounds. When they beat UMass, I was sure they would fall to Rhode Island. When they triumphed against the Rams I was certain they could not beat Dayton. But they did. Why couldn’t it happen again? Thus, I remain hopeful going forward and considering Alan Robinson’s in depth report of the circumstances surrounding the SLU game on Saturday I am convinced that the Dukes came out flat simply because they were tired from the previous two days’ events. While I maintain this positive outlook, tonight’s game will be the true test. Will it go like the UMass game or the SLU game. We will know soon enough. Ken Pomeroy’s projection model expects this game to finish with a Duquesne five point victory 68-63. If this game is played in the 60s then St. Louis has a good chance of stealing this one. As I pointed out in yesterday’s scouting report Rick Majerus has been able to win the tempo war against Ron Everhart’s Dukes. The career series is now tied at 3-3 and this game will settle that. Despite the tendency to play slower Duquesne has been victorious in half of the contests including the previous affair which was played at a snail’s pace of 60 possessions. SLU played its worst game of the year at Duquesne turning the ball over often playing into the Dukes hands. Can Duquesne assert its will again? I highly doubt that if this game is played at a pace of 60 that it will conclude in blowout fashion. Majerus is too good of a coach to let that happen again. The Dukes notched a solid effective field goal percentage of 51.0% in the game in Pittsburgh including a 6-16 performance from behind the arc. The numbers reveal that the Billikens are not particularly good at defending the three allowing a high 35.9 percent from long distance which ranks 244th nationally. That does not tell the whole story however. Despite the high percentage of makes, further analysis shows that SLU allows the smallest percentage of three point attempts to field goal attempts as a whole. Only a little under a fifth of opposing teams’ attempts are from behind the arc. This implies that they do a solid job of preventing three point opportunities and those they do let up are open shots. This means that Duquesne must not rest on their laurels and expect good opportunities they must create them with good offensive movement like was seen in the first 37 minutes of the Rhody game. That is if this game turns into a grind-it-out affair. This game will likely be decided whether or not the Dukes can force turnovers like they did in Pittsburgh. In a 60 possession game, the Dukes forced 20 turnovers or in 33.3 percent of them. If Duquesne can force the Bills who rank 196th in turnover rate into a transition game the Dukes will win. If not, SLU has a shot because they will probably control the tempo if history holds. The Bills lack offensive play makers and are not particularly good at anything as the statistics show. The only positive to pull from the numbers is that Majerus’s club is good at making the extra pass ranking 64th in assists per made field goals. One can expect lots of passes on offense and running down the shot clock. This is another game that Duquesne should win. Today’s contest is a pivotal determinant in where the Dukes will be seeded in the conference tournament. It is likely that URI will lose at least one of their games so the Dukes can maintain their edge on the Rams if they take care of business against St. Louis and St. Bonaventure. Further, this game will show whether or not the Dukes have been affected by their recent losses. It should become apparent pretty quickly much like the UMass game. If the Dukes come out hot they will cruise to a victory. A slow start will likely lead to a close loss. The key is to prove to themselves that they are good team and should win this game and not feel sorry for themselves. We shall see. Hammer, meet nail. Such has been the relationship between Jim Baron’s Rhode Island Rams and Ron Everhart’s Dukes. Baron’s program has managed to play well against Duquesne in recent years as reported by Paul Kenyon of the Providence Journal. URI has been able to handle the Dukes in the past. The Rams, in fact, have won the last six regular-season games between the teams, although Duquesne did upset URI in the A-10 Tournament two years ago. So, of the past seven meetings between these two schools Rhody is 6-1. I have always liked watching the Rams play, their style is appealing to me. URI plays similarly to the Dukes, by trying to speed up the game and forcing opposing teams to make mistakes. As is mentioned in yesterday’s scouting report, Rhody’s defense has improved greatly over the past five seasons mostly due to forcing more turnovers. Baron has relied on full court pressure as the Dukes have but it has always seemed his teams have the edge because the Rams are the superior offensive unit. That’s not so this season. Duquesne has the more efficient offense while maintaining arguably the best defense in the Atlantic 10. That would imply that Duquesne should be able to handle URI, however there is worry that Baron’s superior offensive mind will allow him to pull a few tricks out of his sleeve leaving the contest for the 4th seed in the Atlantic 10 Tournament and a first round bye open. “Even though URI has backed off much of its own pressure defense, the Rams are still second in the A-10 in turnover margin, at plus 2.85. Duquesne is the leader at a whopping plus 7.36,” reports Kenyon. That seems to be a wise decision considering how well Rhody’s defense has played. What should concern the Dukes the most is the team’s overall size. The Rams run an eight man rotation with 6 players being listed at 6’7” or taller. The only player listed at 6’7” in the Dukes’ rotation is Damian Saunders. My concern is that the URI defenders will be able, because of their height advantage, to prevent quality shots for Duquesne. If the Dukes having problems shooting they will likely lose this affair considering that when the Dukes don’t shoot well they generally lose. Adding to this trepidation is that the Rams rank 35th in three point shooting defense, so the Dukes cannot simply count on getting open shots. Fortunately for Duquesne, URI is not a good defensive rebounding club despite their height ranking 240th in defensive rebounding rate. Since there is a good chance that shots will not fall easily Duquesne will need a team effort to crash the offensive boards to make up for any lost shooting efficiency. It will also be critical that the Dukes not just stand around on offense and instead actually run an offense. Rhody has played solid half court defense all season, that is probably not going to change tonight. If I had my wish I would combine Ron Everhart and Jim Baron into one coach: Rom Bahart. I love Baron’s offense but it seems he focuses too much on that end of the floor. Conversely, Everhart gets his kids to play a high effort defense but he fails to communicate any coherent offensive game plan. If we could take the strengths of both and dismiss the weaknesses we would have one hell of a coach. Chances are however that if Rom Bahart did exist he already would be at a big time BCS program. Such is the life for a mid-major program. Nevertheless, Baron’s team has struggled on the offensive end. Rhody, which usually runs an efficient up tempo set pattern offense gets several scorers involved, relies heavily on small forward Delroy James who is used in 30.6 percent of offensive possessions ranking him 29th nationally. The Rams have not depended on one player in that way since Will Daniels graduated in 2008. Overall, this year’s team does not have much going for it on this end of the floor. The team is not a good shooting team nor a good rebounding team. Inability to make shots has placed the burden on James to create for himself and everyone else. Such does not spell out success for URI. Rhody’s offense is middling and its defense is good but will that be enough to beat the Dukes. If past experience is any indicator, URI will put forth a good game plan to beat the Duquesne and keep themselves in the hunt for a first round bye. My theory as to why Rhode Island performs so well against Duquesne’s pressure is that since they normally press they know how it works and thus how to beat it. It could easily happen again. The magnitude of his game for Everhart’s team and program is enormous as it would mark the most wins a Duquesne team has ever had in the Atlantic 10 along with it implications regarding conference tournament seeding. This game is by no means in the bag for Duquesne. The Dukes clearly are the better team by a large margin but UMass might just have enough to give them problems. UMass has struggled as of late and if guard Freddie Riley cannot play it leaves an already shorthanded minutemen team even more so. Duquesne, which has struggled needs to get this win to prevent another late season swoon that has been so common under Ron Everhart. A victory in Amherst would greatly help the Dukes cause, briefly moving them into second place in the Atlantic 10 ahead of Temple and Richmond who face off tomorrow. All games from here on out are critical to a Duquesne club that is looking finish in the top four in order to punch a first round bye ticket to Atlantic City for the conference tournament. The Dukes currently hold a two game lead over leading competitor for such a bye Rhode Island. Dropping any contest from now until next Wednesday’s contest with the Rams opens the door for Rhody or any other team looking for a top four finish. The Minutemen possess a much better defense than offense allowing only .990 points per possession ranking them 117th nationally. Their defense is built around forcing tough shots in which they only allow 32.6 percent from beyond the arc (80th) and merely 45.6 percent inside it (88th). The percentage allowed from long range should worry Duquesne, who puts up a high 37.6 percent of attempts from three point distance. One area where the Dukes seem to have an advantage is in offensive rebounding where despite being small they crash the offensive boards well. Duquesne ranks 104th in offensive rebounding rate compared to UMass which ranks 245th in defensive rebounding. Another distinct potential advantage is in drawing fouls where UMass ranks 255th in free throw rate compared to Duquesne’s offense which comes in at 26th. Obviously, many teams strategically foul the Dukes due to their pathetic 62.7 percent mark. According to Tribune Review writer Dave Mackall, free throw shooting has been stressed at practice this week following the Xavier game, in which the Dukes felt a poor performance from the line sunk their chances. A better performance from the charity stripe will likely give Duquesne the victory no matter how poorly they play. One good sign for the Dukes is that UMass also has given up a high assist rate (assists per field goal made) which corresponds with Duquesne’s offense which ranks 4th in the country in that department. However, if the Dukes offense plays like it did in the second half of the Xavier game with players standing around and waiting for the play to come to them another sub-par offensive performance may be in store. This is the true mismatch of this game. UMass ranks 220th in offensive efficiency compared to Duquesne’s defense which ranks 28th. However, there is room for concern for the Dukes. The Duquesne defense is designed around forcing turnovers as evidenced by its number one ranking in turnover rate. The Minutemen are relatively good caretakers of the ball ranking a respectable 121st in turnover percentage. The Dukes have had little trouble turning over other teams, even those that rank higher than UMass which could curtail any benefit for the Minutemen. A more tangible threat is the offensive glass. Duquesne is a terrible defensive rebounding team, although they did better than usual in the Xavier game. A quick sidebar. Contrary to popular belief, lack of size did not cost Duquesne the game on Sunday. What killed the Dukes on Sunday was poor defense of the three point line, particularly of Dante Jackson, bad free throw shooting and too much standing around on offense. As I mentioned yesterday in the scouting report, I expect Sean Carter (who is not Jay Z) to have at least a double-double if not a bigger game due to his offensive rebounding prowess. The Minutemen may be wise to work Carter into the offense more but as I discussed yesterday that is not the way Derek Kellogg’s defense works. The offense will run through Anthony Gurley as it always does. He will take most of the shots and be featured in most Minutemen possessions. UMass simply does not have the personnel to run a John Calipari inspired dribble drive offense. There is no point guard who serves as an affluent passer nor is there a good passer that can be a primary offensive option. UMass will struggle until they find someone who can fill that role. This year they do not have that guy and thus the offense has sputtered. I fully expect Duquesne to have a good showing. I really like what I’m hearing out of the Dukes’ locker room, especially from Bill Clark. Bill Brink at the P-G gives a good synopsis of the mood amongst the team. “Don’t let one loss turn into another one,” was one point made by Clark, said freshman Mike Talley. Duquesne, which has lost two games in a row, can test that principle tonight against Massachusetts in Amherst, Mass. The Minutemen, losers of their past three games, face a similar challenge. Do the Dukes have it in them to fight off two straight tough losses. It will be seen tonight in a game that the Dukes should win handily but easily, due to matchup concerns could go awry. Lets hope Ron Everhart’s club gets back to its winning ways.